We recently held an ustwoTHINKS: Immersive, where we explored the latest in immersive technology, its applications and where the future is headed for AR/VR and beyond. Our speakers were Jason Juma-Ross, Head of Tech APAC Facebook, Iain Nealie, Creative Director, Google, and Simon Ward, Design Lead ustwo Sydney. We find ourselves at an interesting tipping point for immersive tech, where AR/VR/MR is teetering on the edge of mainstream adoption. For consumers, the barrier to entry for VR is undoubtedly the need to buy and wear ungainly headsets. You also need powerful PC’s, a physical space for the cameras to be mounted, and innumerable cables. It is also prohibitively expensive; the cheapest on the market is $400, while the Magic Leap (touted to be the next big thing) will retail for over $2000. While AR may not have an equipment problem- all you need is a smartphone to activate an experience - for many brands AR is still seen as a gimmick-y marketing tactic; the use cases have not convinced the right people that this is the future of how to engage with consumers. However, this is changing. We believe that immersive is becoming more accessible. More accessible for the makers and creators who are responsible for creating those experiences. The technology platforms developed by tech behemoths like Google, Facebook and Apple are enabling a new generation of makers to prototype ideas quickly, experiment and deploy engaging short and sharp experiences without a team of developers and computational power behind them. We also mean accessibility in terms of a platform for brands to engage and communicate with their customers. With the ability of a small team to shoot out ideas quickly, brands can have more fun, see how they can explore the 3D world and enhance their products or brand message without needing to drop hundreds of thousands and months of work on executing a complex brief. Lastly, we are looking at accessibility for the user. With nearly 2.5 billion people owning a smartphone worldwide, the ability to experience a piece of AR or even VR (hello Google Cardboard) is only an app or swipe away. Not only that, AR, has the potential to become a truly social experience, with more than 2 billion Snapchat, Instagram and Facebook users engaging with AR technology every day without even realising it. • Spark AR is the AR design platform from Facebook, and anyone with some knowledge of design software and 3D environments can pick it up quickly. This enables designers of all backgrounds to be able to experiment and prototype 3d elements, worlds and filters for the Facebook platform- without needing an engineering or animation background. • Unity and Unreal are powerful and complex game engines where designers have complete control over the worlds and characters they wish to create. 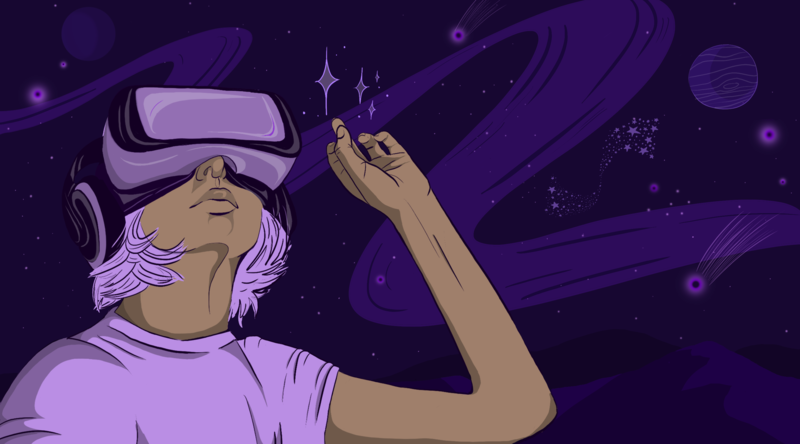 These are the platforms for creating VR- and while a high level of technical skill is needed, they're platform agnostic so you can deploy and build to any platform, mobile, or console. They also have a massive, engaged community of people making quickly downloadable assets which saves a lot of time if you need to prototype or quickly create a proof of concept. The future will be immersive- by 2022 there will be a global spend of 200 billion dollars on creating and experiencing AR & VR. Brands need to harness this technology to tell a compelling story, to delight and surprise and not to be left behind. Below are some of the brands who are using immersive effectively. • Sephora: Using accurate face tracking, you can try on a new look, share it in a story and ask your friends for advice. An effortless but effective way of using AR for online shopping. • Porsche: The app allows the user to see different views of the Porsche Mission E concept model. The vehicle can be virtually placed in a room, customised to the user’s preferred colour and it’s even possible to go on a test drive using augmented reality in the interactive driving mode. • Australian War Memorial: A unique immersive experience where 100 people wear VR headsets simultaneously and choose to become an infantry soldier, pilot, tank command etc. and experience a different battle. A unique form of interactivity in a location-based space where 100 people are in it at the same time, all having a linked but separate experience. • Stargazing Live: Synced with a live TV broadcast viewers were able to use AR to assemble the ISS Space Station in chronological order as it was assembled over the years, timed with the events on the broadcast. • eBay: eBay is taking advantage of motion tracking and environmental understanding to place a real-world item inside virtual shipping boxes of various sizes to help buyers and sellers identify which shipping box best fits their items. Go where the people are and make it easy for your brand to engage with your audience to find you. All the success stories and apps, the ones that last a long time are the social ones. Before creating any immersive experience there has to a product fit, and social is a way to engage users and the community. Hand detection: is the next frontier of a truly immersive experience, allowing people to control, pinch, swipe and grab while wearing a VR headset or manipulating Pokemon characters in AR. Always On: Google Lens is pioneering the idea of being able to open up your camera and it becomes a window into a new world. What if there was no smartphone interface, and every device was merely a camera into a world of interfaces? It’s a logical next step in our camera obsessed world. World Mapping: As more and more people use AR and VR and ‘map’ the world on their devices, it makes sense that companies like Apple and Google who have cloud services can harness all the visual world data and put into one collective pool of AR markers and surface maps. They will able to build a digital world around us that anyone could have access to. Get started: What we know now is AR and VR are not emerging technologies and already offer a unique way for your brand to tell a story. It is accessible to makers, and your customers and what we have highlighted in our previous post is that the brands that think beyond it as a gimmick have real monetary gains to be made.